What made it so good? 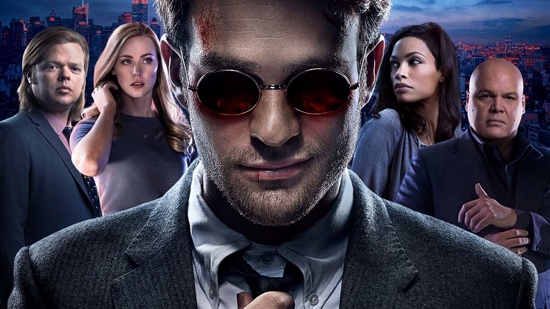 The unexpectedness of how well accomplished the show's story and performances were, as memories of the misguided 2003 Daredevil movie refused to budge before its debut. Daredevil is quite a prominent Marvel superhero, but concerns he was being shunted to television (when he could theoretically work just as well on the big-screen, as part of The Avengers) proved unfounded. This was actually the perfect medium to tell a Daredevil story heavily inspired by the most acclaimed graphic novels, with an excellent cast serving the material extremely well. I don't think anyone expected Vincent D'Onofrio to create one of the most sympathetic-yet-horrifying villains we'd ever seen, and throughout the first season the show kept on surprising us. The fights were extraordinary cool and realistic (putting equivalent, CGI-augmented scenes in Marvel's movies to shame), and it was a joy to binge-watch this over a long weekend. Flaws? Yeah, it has some. The ending was a bit of an anticlimax, and I really dislike the Daredevil costume (which arrived with undeserved fanfare), but these were very minor issues. The best moment? The hallway fight scene, that arrived in episode 2 and hooked us until the end. An unbroken take expertly choreographed to hide its seams, as Matt Murdoch kicks and punches his way through a seemingly never-ending horde of thugs. It was amazing. Oh, just watch it below. Even in isolation it rocks. Watch this if you like: Marvel, Agents of S.H.I.E.LD, Jessica Jones, Arrow, and the Daredevil comics. I'm counting down my 10 Best Television Shows of 2015 this year, so check back tomorrow to see what's at number 4. The whole list can be read here.